Here we are less than a week away from Thanksgiving and almost a month away from Christmas! Where has this year gone? I’m getting so excited for Thanksgiving next week, I’ve got my long list of ingredients going and can’t wait to chow down on all of my favorites… but to be honest every Thanksgiving dish is my favorite especially that post-Turkey Day leftover sandwich – turkey, cranberries, gravy mashed potatoes all in one. That’s living! 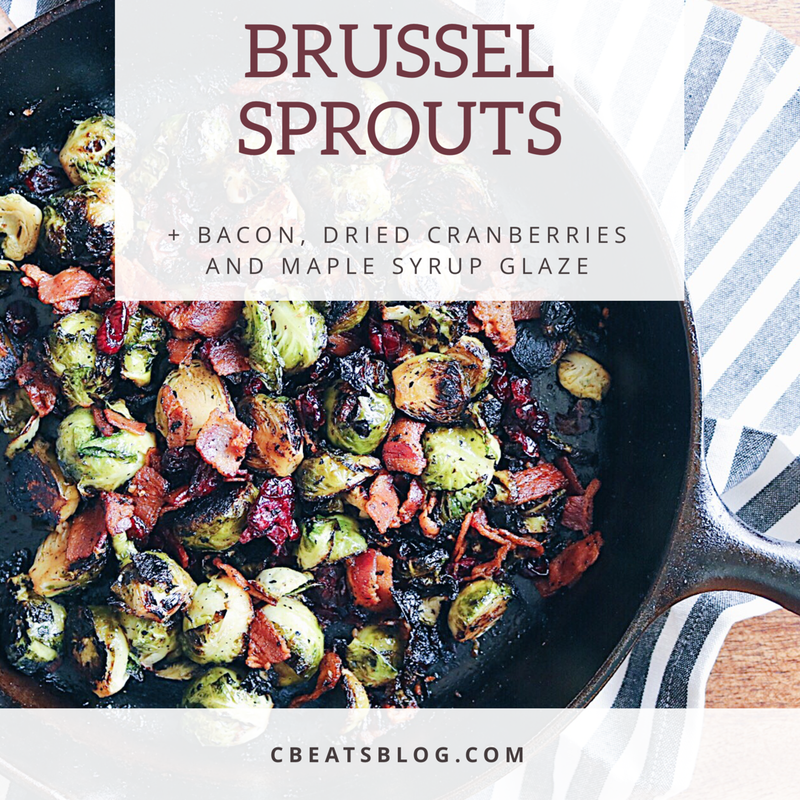 If you’re in charge of making a side dish this year and want to mix it up I recommend these Brussel Sprouts with Bacon, Dried Cranberries and Maple Syrup Glaze. 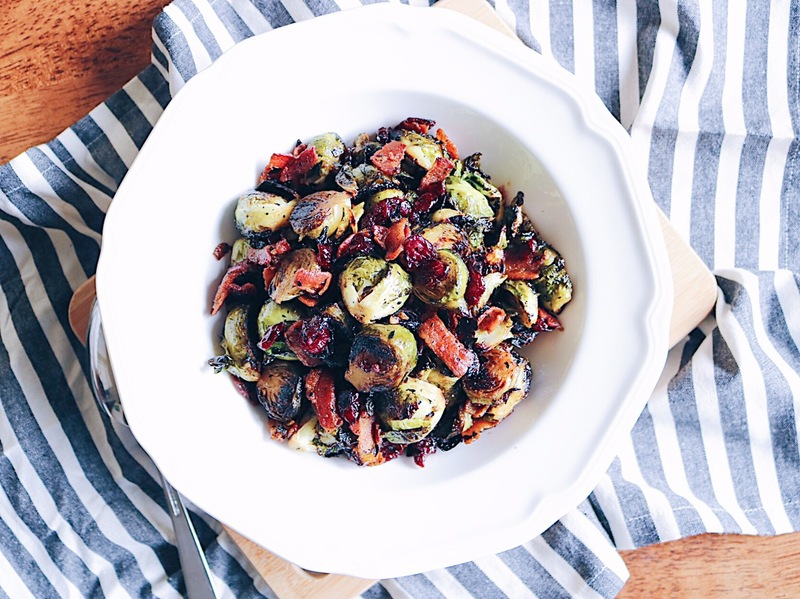 It’s a sweet and savory take on brussel sprouts with everyone’s favorite – BACON. This dish is so flavorful and yet very simple to make. Plus it’s a one-pan dish which couldn’t be better on a day like Thanksgiving when you’ve got all 4 burners going plus your oven’s working on overdrive and a mountain of dishes are piling up while you get everything ready for the big feast. This is also a great recipe if you or one of your guests is gluten-free or dairy-free, it’s nice to have a little something for everyone. You’ll cook the bacon and get it nice and crisp – you’ll be fighting off people who want a little bacon app. while they wait for the final dish Cut the stumps off the brussel sprouts and cut them in half. 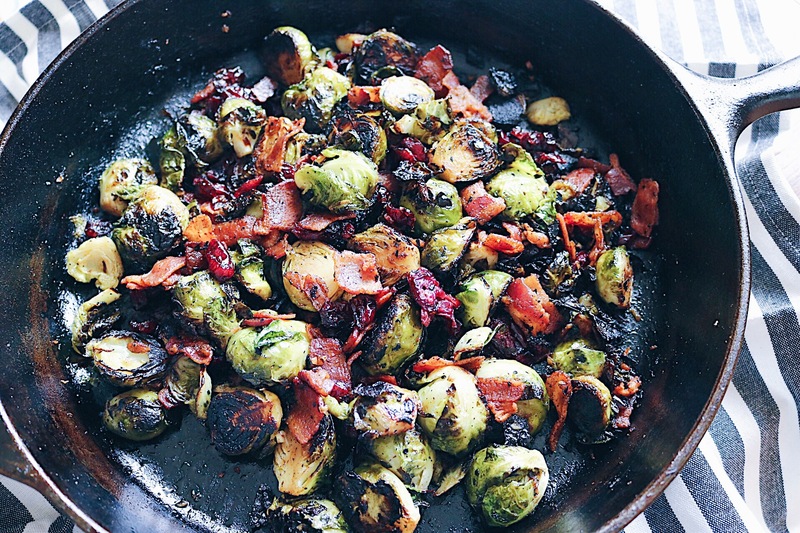 Let the brussel sprouts sear and caramelize cut side down in the bacon grease – a.k.a. flavor town. Add some garlic then add the crispy bacon, dried cranberries and the maple syrup glaze Voila! You’re ready to serve – told ya it was easy, and this dish is full of flavor and texture and sure to be a crowd pleaser. You can dig right in, or if you’re nice you’ll plate it and serve it to your loved ones. This one will disappear quick so be sure to plan out where you’re cutting into the buffet line. I’m so excited to see everyones Thanksgiving day posts full of food, family, friends and football! We’ll be spending the day with our football family and are so thankful to have them in our lives. 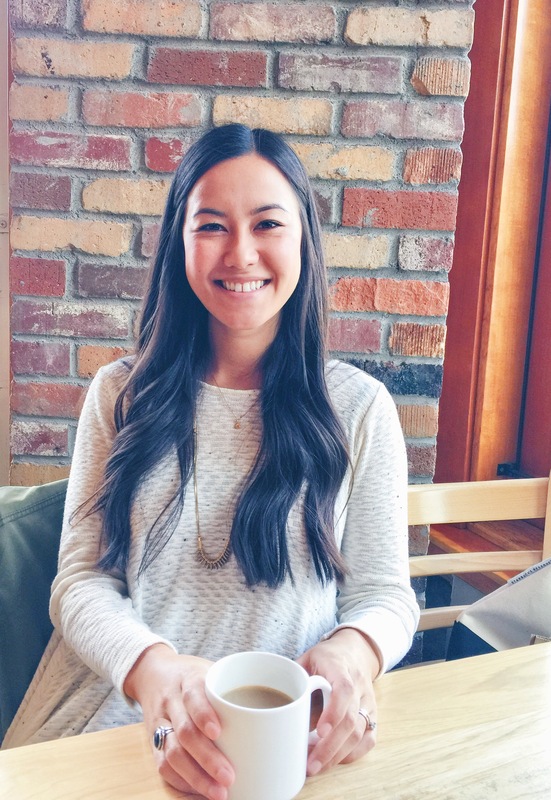 Hope this recipe inspires you for your Turkey Day festivities and you give it a try! 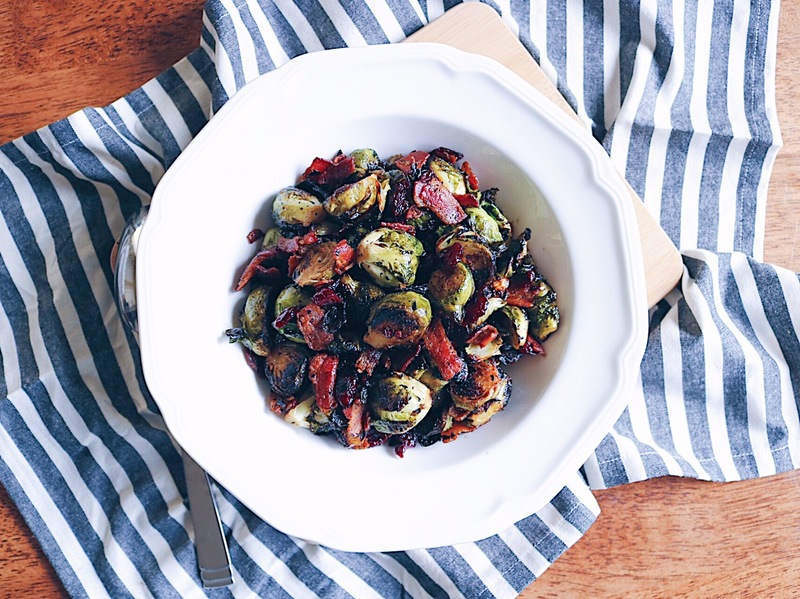 Sautéed and caramelized brussel sprouts tossed with crispy bacon, sweet dried cranberries coated in a maple syrup glaze - a simple and flavorful fall side. 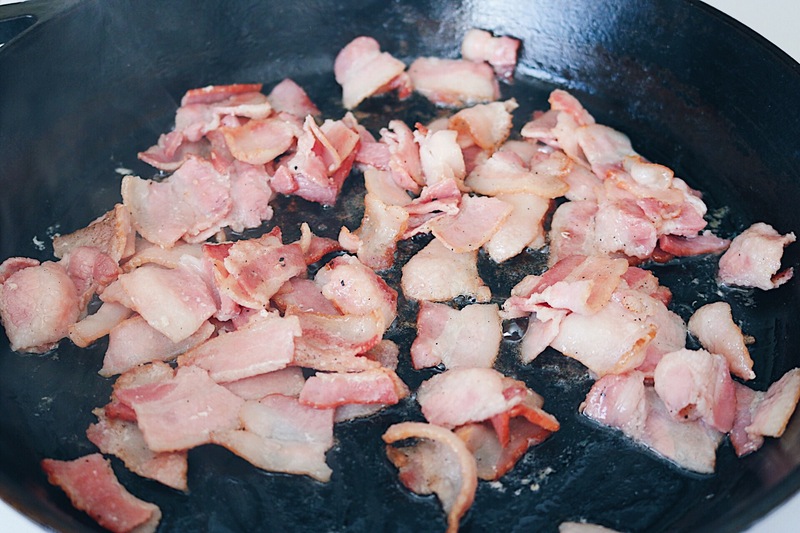 Heat a large skillet over medium heat and cook the bacon pieces until they’re crisp. Remove the cooked bacon and set aside on a paper towel lined plate. 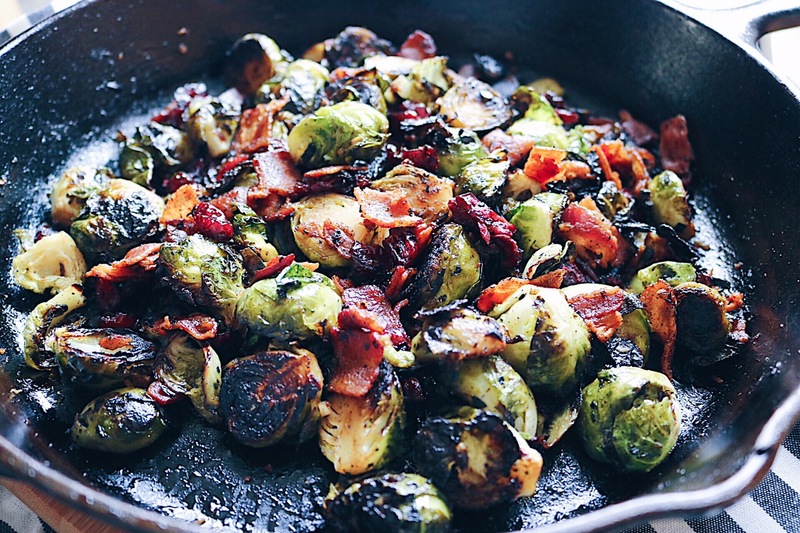 You’ll want to leave about 1-2 tablespoons of bacon grease in the pan, removing any excess. 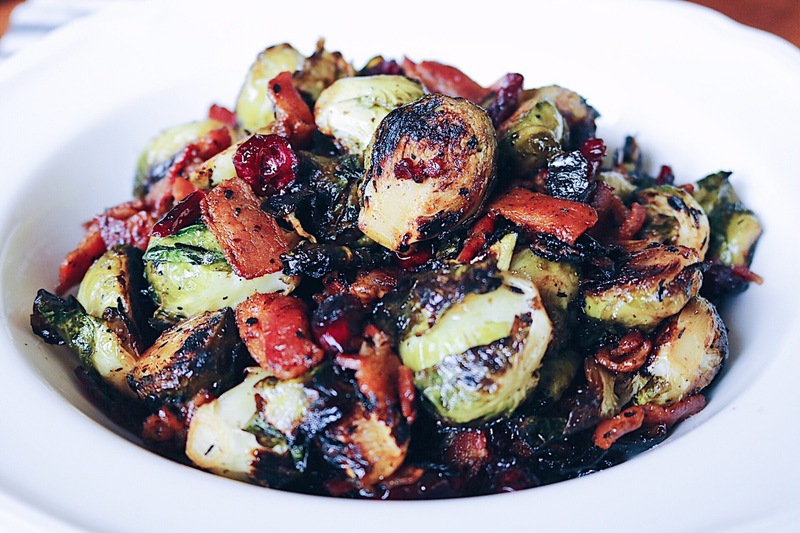 Add the halved brussel sprouts, making sure as many as possible are face down to start then don’t touch – allowing the cut sides to caramelize and sear for 5-8 minutes. 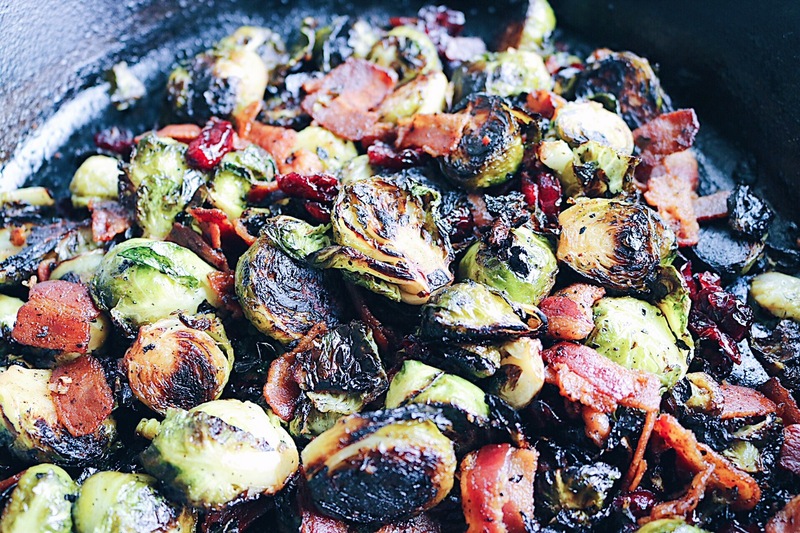 When initial cooking time is complete stir and allow the brussel sprouts to brown on all sides and soften for another 5-8 minutes. 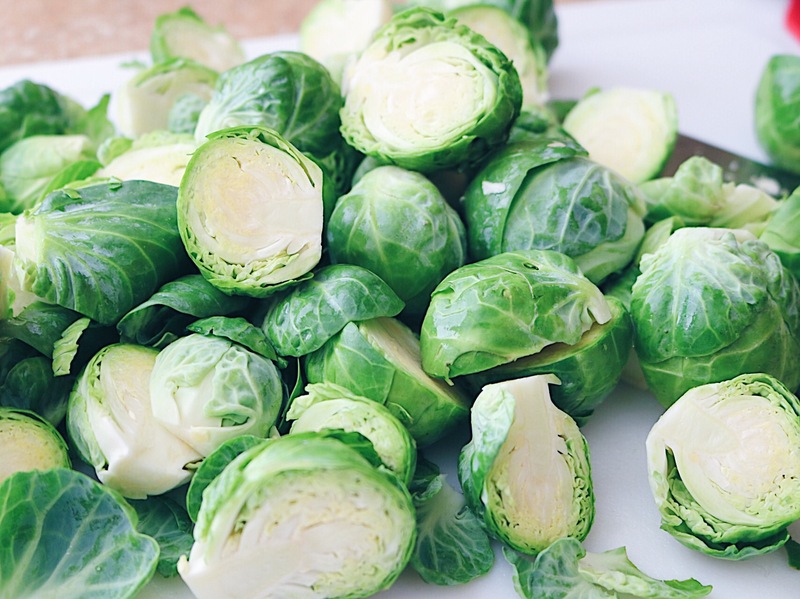 While the brussel sprouts are cooking combine the maple syrup and apple cider vinegar in a small bowl. 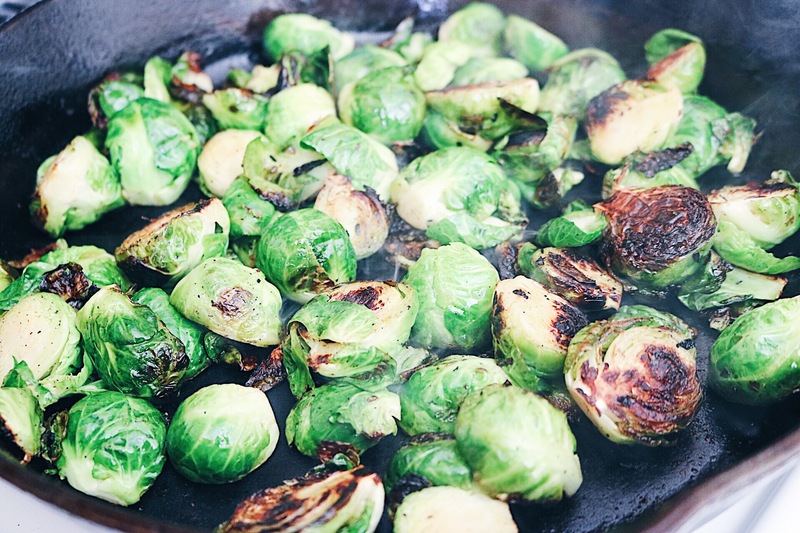 When the brussel sprouts are finished cooking through, add the minced garlic allowing to cook for 1 minute, stirring constantly to avoid burning the garlic. 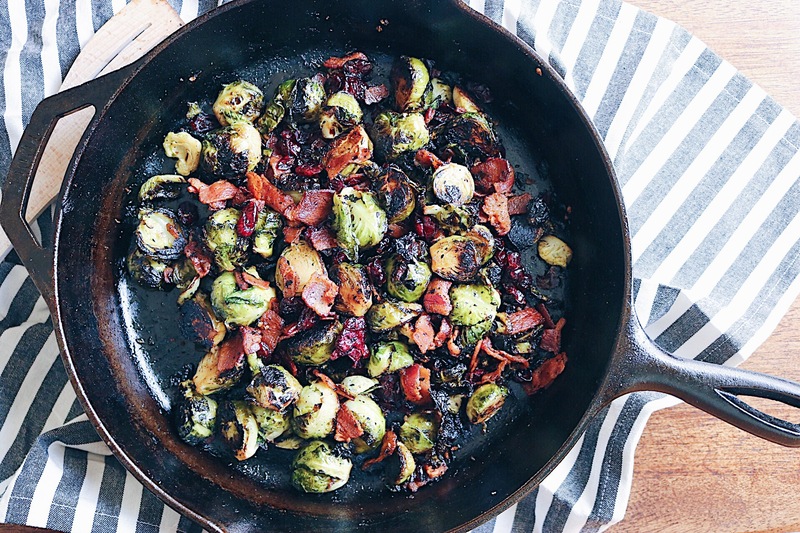 Remove the skillet from heat and immediately add the cooked bacon, dried cranberries, maple syrup glaze, and season with salt and pepper. Stir everything together until it is evenly coated in the glaze. ermagerd, this looks fab. need this ASAP.